Joe Johnson - Hamilton ManagementHamilton Management - Hamilton Management is a talent management agency exclusively representing a wide range of actors, experts, presenters, sports personalities and broadcast commentators.The company was founded in 2012 by Alan Hamilton who successfully managed and worked with TV personality Craig Phillips for 6 years 2005-2011. Joe Johnson is a snooker legend, he became snooker World Champion in 1986 and nearly won again the following year in a tense final. 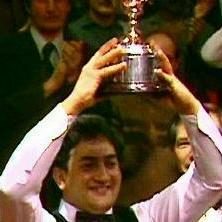 In 2013 he was inducted into the World Snooker Associations Hall of Fame. He remains an instantly recognisable face in the game today with countless other victories under his belt. 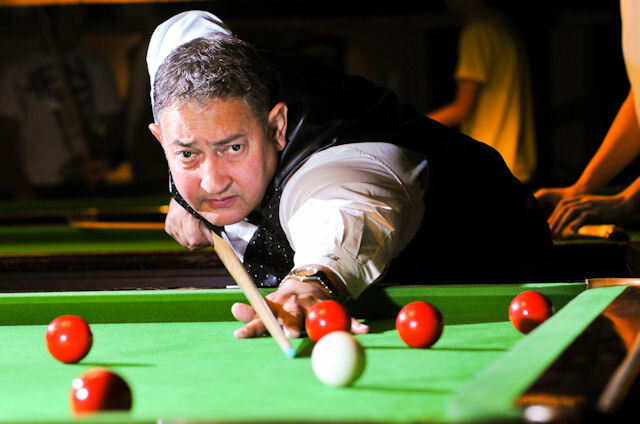 In addition to Legends tour events and TV commentary, Joe owns snooker clubs in his home county of Yorkshire,within these venues he runs a coaching academy. He remains a global ambassador for the sport. Having played superbly throughout his career and commentated for many years, there is no one more passionate, and dedicated to snooker as former World Champion Joe Johnson. He is a respected pro and is available on non legends playing dates for broadcast match commentary on curling and other winter sports, expert analysis, views ,opinions,interviews and column writing contributions to publications. He has also appeared as a guest on many TV and Radio shows notably including several episodes of BBC snooker game show Big Break and more recently Eggheads for BBC2. 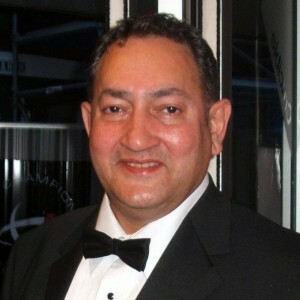 Joe Johnson chequered history has given him plenty to dwell upon and he is available on non playing dates for public after dinner and motivational speaking and is comfy to speak and be on hand to present at awards events. He is a humble professional with a warm, lively and entertaining speaking ability. At awards, after dinner and motivational events he can inspire audiences of all ages to include aspiring athletes and young people. Events like this provide an opportunity to gain an insight into the pride and passion, professionalism and determination involved in being a successful sportsman. Joe’s experiences of winning the biggest tournament in the sport and playing all over the world give him a great insight into what it takes to succeed and compete at the highest level. Joe’s public speaking topics can be tailored to suit sporting or business audiences in addition to educational audiences and appropriate inspirational talks for young people of all abilities and backgrounds. Due to his high level of expertise Joe is available on selected non playing / commentary dates booked in advance for corporate snooker exhibitions and can source other top professional’s to join him if required. It is a fun, enjoyable insight into the sport for anyone and is especially appropriate for corporate companies wishing to team build staff or impress clients. Joe is on hand throughout to guide on gameplay and in doing so motivates & inspires, dwelling on his experiences in competitions in a very informal and relaxed manner. Joe is available to support corporate and product endorsements or campaigns. Joe is available on non playing / commentary dates for venue openings, personal appearances, product launches, golf days, corporate support, educational & sporting motivation. Joe is keen were he can to support charities and good causes he feels strongly about and is open to receiving charity enquiries. One of the best amateurs of his time, Joe was National Under-19 champion in 1971 and three times Yorkshire Champion. He was runner-up to Terry Griffiths in the English Amateur championship of 1978 and, with Terry being a Welshman, that qualified him as England’s representative in that year’s World Amateur in Malta. He gave a very good account of himself reaching the final where Cliff Wilson proved too good for him. That prompted him to turn professional in 1979. Joe got off to a slow start as a professional, never getting beyond the qualifying stages of his first four world championships. A quarter-final in the 1982 Professional Players Tournament earned him his first ranking points and that season he reached the Crucible stage of the Embassy for the first time but lost his opening match. When he again lost in the first round of the Masters at Wembley people started to say that he could not perform in front of the TV cameras. It was not until the 1985 Mercantile Credit Classic that he won his first televised march. As an amateur however he held the world record break of 140; and that was televised! In the meantime, the 1983 Professional Players Tournament, provided him with his first ranking final. 1-6 down to Tony Knowles at one stage, he fought back and only lost in the decider 9-8. Needless to say, this event was not televised. When he finally laid the TV ghost in that 1985 Mercantile Credit event he went on to reach the semi-final and ended that year in the top 16 – just. The 1985/86 season got off to a modest start with just two quarter-finals and Joe Johnson arrived at the Crucible in April as a 150-1 outsider still looking for his first match win at that venue. In fact he had still not earned a single ranking point from the world championship in six attempts. This time, however, he got off to a good start with a 10-3 beating of Dave Martin and he had finally got that first win under his belt. Mike Hallett was his second round victim and then he edged past Terry Griffiths by the narrowest of margins, 13-12. He saw off Tony Knowles in the semis before facing Steve Davis, determined to regain the title he had lost to Dennis Taylor. Joe proved up to the task and ran out the winner 18-12. Joewas champion of the world. Winning the world title seemed to have an adverse effect on his form and he had a poor season in 1986/87 not getting beyond the last 16 of any ranking event and again was given no hope of retaining his world title. In the event he surprised everyone and reached the final again. This time however, Steve Davis got his revenge by 18-14. This did however prove to Joe, as much as to everyone else, that he was good enough to win tournaments and he started the 1987/88 season by taking the Scottish Masters title. He followed this with a UK semi-final and got to the last four of the Masters. His second world final had taken him to fifth in the rankings but it proved to be down hill from then on. By the end of the 1989/90 season, although he picked up the non-ranking European Grand Prix title, he had dropped out of the top 16, never to return. His eyesight was also giving him problems and he took a while to come to terms with playing in glasses. He did get back to the scene of his greatest triumph, the Crucible, in 1991 but did not get beyond the first round and since then his best performances have been a couple of quarter-finals in ranking events. With some health problems which he has since overcome, Joe retired from professional matchplay in 2003/04. Joe Johnson remains the player who came closest to beating the “Crucible curse”, in that no first-time world champion has ever successfully defended the title. Joe Johnson’s defence saw him both reach the final and come within four frames of victory. Joe Johnson also won the Seniors Pot Black Trophy in 1997, beating Terry Griffiths in the final. He was also an early influence on, and friend of, the late great snooker player Paul Hunter. Today Joe Johnson remains a snooker ambassador, he runs 3 clubs and has his own coaching academy within these. He commentates for various broadcasters on televised tournaments to include Eurosport. He is married with five sons and two daughters. In 2013 he joined the Snooker legends tour and was inducted into the World Snooker Association’s Hall of fame. Joe Johnson at Snooker World Championships for Eurosport.